My recipes for carrots include the best carrot cake, nutty carrot bread, glazed carrots, sweet and sour carrots, maple dill carrots, roasted carrots, carrot raisin drop cookies and more below. These are typically found in supermarkets and are larger carrots (usually varieties bred for consistent color and sweeter taste) that have been machine cut to achieve their tiny size and uniform shape. Carrots will keep for weeks in the refrigerator. Store them in plastic bags, or cut carrots can also be stored immersed in water in a plastic container (some experts recommend changing the water every few days), before using them in recipes for carrots. Do not store carrots near apples, bananas or melons as the ethylene gas those fruits produce will increase the bitter tasting compounds in the carrots called isocoumarins. 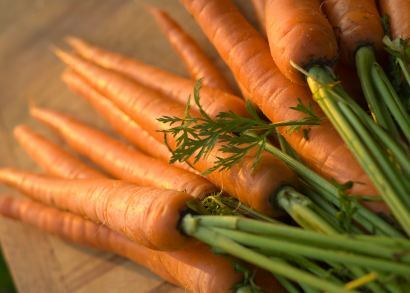 Carrots should be thoroughly washed and scrubbed before using them in recipes for carrots. It is not necessary to peel them, although many cooks prefer to do so because it will change their surface texture and also will remove the outer layer that may contain more pesticide residue than the inside of the carrot. Carrots are loaded with vitamin A. Look for red or purple colored varieties, which are packed with anthocyanins, and look wonderful in many recipes for carrots. This information is courtesy of Whole Food Market. Bring ingredients to a boil in a saucepan. Cover and reduce heat simmering until carrots are tender; approximately 5 to 8 minutes. Take cover off and cook until juice has been reduced (5 minutes or so). Season with salt and pepper. Serve. This recipe for carrots is a winner in my book. PREHEAT oven to 350 degrees; grease and flour a 9x13 inch pan or two 9" cake pans. In a large bowl, beat together eggs, oil, sugars and vanilla. Then mix in flour, baking soda, baking powder, salt and cinnamon. Stir in the carrots and fold in the walnuts. Pour into your prepared pan(s). Bake for 40-50 minutes, or until a toothpick inserted in the center comes out clean. Let cool in the pan for 10 minutes, then turn out on a wire rack to cool completely. To make the frosting, combine the butter, cream cheese, powdered sugar and vanilla. Beat until smooth and creamy. then fold in the walnuts and frost your cooled cake. 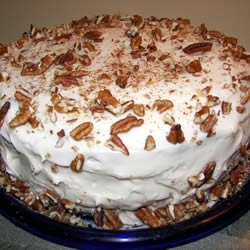 This recipe for carrots produces the best carrot cake. This recipe for carrots is old fashioned goodness packed in a loaf of bread. Delicious. PREHEAT oven to 350; grease and flour two loaf pans. Sift together, baking soda, salt, spices and flour. In a bowl, combine the carrots, pineapple with juice, oil and sugars. Mix in the eggs and slowly add the sifted flour mixture. Mix well and fold in the walnuts and raisins. Pour into the prepared loaf pans. This recipe for carrots produces such a lovely carrot bread that family and friends will love. Recipes for carrots would not be complete without this treasure. It has a sweet and rich taste that everyone will love. Try it! Heat the glaze ingredients to a low boil and cook until thick. Let cool for a few minutes. 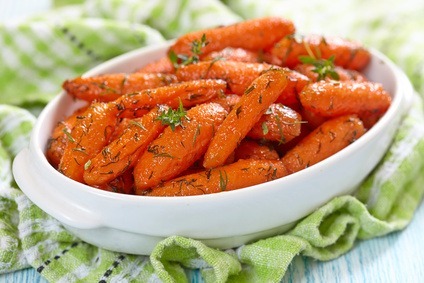 Cook the carrots until tender in a pan with a small amount of water; drain. Pour the prepared glaze over the carrots and serve. The recipe for carrots is wonderful during the holiday season. The cinnamon adds a wonderful touch. Cook the carrots until tender and drain. In the meantime, melt the butter in a pan over low heat and stir in the sugar until it is dissolved. Add the ranch mix and stir - finally add the carrots. Increase the heat to medium and cook for 5 minutes or until the carrots are hot and glazed. When you have fresh vegetables on hand, my next recipe for carrots is really a delicious side dish with a sweet and sour crunch. In a large bowl, combine cucumbers, carrots, onions and green peppers. Sprinkle with salt and toss to coat. Refrigerate for 2 hours. Combine sugar and vinegar and stir until dissolved. Stir until coated and chill for another hour. Serve with a slotted spoon. Steam or boil the carrots until tender; drain. Melt the butter in a saucepan and add the brown sugar and dill. Mix the cornstarch with the water and add to the glaze and cook until thick. Season with salt and pepper to taste. Add the carrots to the glaze and stir until coated evenly. It's ready to serve. I love this recipe for carrots recipe. A lovely twist of flavors. The day before, steam or boil the carrots until tender. Drain and puree the carrots with the sugars, vanilla and butter. Refrigerate overnight. PREHEAT oven to 350 degrees and you will need a 2 quart baking dish. The following day add the flour, baking powder and eggs. Mix well and pour into the baking dish. Bake for 1 hour or until the top is golden brown. Sprinkle lightly with the powdered sugar before serving. I love roasted vegetables and this recipe for carrots delivers. Simply delicious. PREHEAT oven to 400 degrees and you will need a cookie sheet. Pour the olive oil into a resealable bag and add the carrots. Shake until evenly covered with the oil. Place single layer on a cookie sheet and season with salt and pepper. Bake for approximately 20 minutes or until the carrots are browned and tender. Before serving sprinkle with dill or parsley. Cook carrots and celery in a small amount of water until tender. Drain and set aside. Add enough water with the pineapple juice to make 1/2 cup. Stir in the vinegar, cornstarch, soy sauce and salt. Cook until this thickens, stirring frequently. Add butter, drained pineapple and onions; stir until all ingredients are heated through. Add the drained carrots and celery. Cook approximately two minutes and then add the sugar. Cook until dissolved. This is also good over white rice. PREHEAT oven to 375 and spray a cookie sheet with vegetable oil. Using a blender or food processor, process oats until it is the consistency of flour. Set aside in a small bowl, and then finely grate your carrots and chop the walnuts. In a mixing bowl, combine the brown sugar, vanilla, egg, and butter beating until fluffy. Add oats, flour, baking powder, salt and cinnamon. Stir in the grated carrots and raisins last. Drop by large spoonfuls on greased cookie sheet and bake for 10 minutes or until golden brown. Cool on wire racks before frosting. To make the frosting beat the powdered sugar and orange juice until it is spreading consistency. Frost cooled cookies. I have another recipe for carrots below that produces yummy cookies. My last recipe for carrots is a wonderful cookie that kids love. I like to make them in the fall with cinnamon and nutmeg perfuming the kitchen. Mmmm. PREHEAT the oven to 350 degrees, and lightly grease a cookie sheet. Cream the butter with the sugars until light and fluffy. Beat the eggs with a fork and add to the creamed mixture. In a separate bowl, mix the baking soda, baking powder, salt, flour, cinnamon, nutmeg and rolled oats together. Add to the creamed mixture. Fold in the carrots, raisins and nuts. Add the spicy rum. Mix until well combined. Drop by teaspoons full on prepared pan and slightly flatten with a fork. Bake for 25-30 minutes.